The Fiesta Bowl shows that college football is more innovative than the NFL. It's all too rare that a classic sporting event ends with a play that even Chip Hilton wouldn't have the gumption to try. Rather than kick a sure-thing extra point to tie up Oklahoma in overtime, Boise State coach Chris Petersen decided to win Monday night's Fiesta Bowl with a play that looked like it was hatched in a seventh-period P.E. class. * The climactic play started innocuously enough, with Boise State quarterback Jared Zabransky faking a screen pass to the right side of his field. Zabransky then hid the ball in his left hand before handing it off behind his back to Ian Johnson. The Boise running back ran around left end, untouched, for the winning two-point conversion. Final in overtime: Boise State 43, Oklahoma 42. 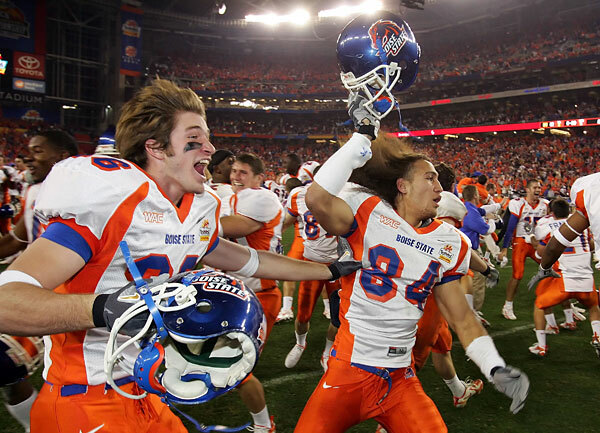 Boise State's game-winning Statue of Liberty play was merely the Broncos' final magic trick. Moments earlier, Boise had scored consecutive touchdowns on a 50-yard hook-and-ladder and a fourth-down halfback pass. If the Fiesta Bowl didn't provide enough acts of coaching nonconformity, there was the Rose Bowl, in which USC's Pete Carroll chose to air the ball out repeatedly in the fourth quarter rather than run out the clock. Meanwhile, West Virginia steamrolled to 38 points in the Gator Bowl behind its retro-chic single-wing offense. What all these bowl games revealed, once more, is that college football is a game ruled by innovators and aggressors. Compare that to pro football, a stolid, inertial sport in which the coaches compete to see who can be the most risk-averse. Admittedly, the 2006 college season—top story: Rutgers!—has been a huge comedown from 2005's Bush-Leinart-Young-a-palooza. But even in a year that didn't have much going for it before Boise State started hook-and-laddering college football was still a lot of fun to look at. Watch football on a Sunday afternoon, and you'll see 32 teams running more or less the same plays. Flip channels on a Saturday, however, and you'll find all sorts of different styles—teams that should be playing in the 1940s versus teams that would be at home in the 2040s. Even better, the sport's weirdo outliers—Navy's triple option, Florida's spread, West Virginia's modernized single wing, Hawaii and Texas Tech's adrenalized passing attacks—aren't simply wacky novelties concocted by desperate coaches. Texas Tech, Navy, and Hawaii have become perennial winners on account of their unconventional offenses. West Virginia just won 11 games for the second year in a row. In a mere two years, Urban Meyer's spread has taken Florida to the national championship game. In college football, the innovators win. Not only are college coaches more imaginative than their pro counterparts, they're also less defensive. Fake punts and fourth-down conversion attempts, acceptable gambles in the college game, are considered needlessly chancy by the majority of NFL coaches. It's conceivable that an NFL team would have attempted the last-second hook-and-ladder play that sent the Fiesta Bowl to overtime—desperate times call for desperate play-calling. (Music City Miracle, anyone?) But would any pro coach have had the gumption, as Boise's Chris Petersen did, to go for the win with a two-point play rather than kicking the sure extra point? Is it even worth asking if, say, Washington Redskins coach Joe Gibbs would have signaled in a Statue of Liberty play? College football's distinctive offenses have arisen partly out of necessity. Since talent is distributed much less evenly in college than in the NFL, many coaches at lower-tier programs come up with novel schemes in order to compete with better-stocked opponents. In college football, innovation filters upward—smart, successful coaches at smaller schools (like one-time Bowling Green head man Urban Meyer) get promoted up the chain and bring their schemes to the sport's top programs. The college football rulebook also helps foster creativity. The wider hash marks in NCAA football—which give speedy runners like West Virginia's Steve Slaton additional acreage to outflank defenders laterally—encourage coaches to conjure impressive-looking, run-oriented schemes that wouldn't work in the NFL. The relative predominance of imaginative play-calling in the NCAA, though, says less about college football than it does about the culture of the NFL. A pro-football coach's first instinct is self-preservation. NFL head-coaching jobs are such a rare commodity that it's foolish to fritter one away by trying something different. Besides, if a coach resorts to too much trickery, isn't he admitting he's not good enough to take on his opponents straight up? One would think that the economics of the NFL would argue strongly for innovation by bad teams. The Titans present one such case study—the upside gains of deploying a nontraditional quarterback like Vince Young are so enormous that it's worth the risk that he won't hack it. It's far more common, though, that NFL teams try to mold a unique talent like Young or the Falcons' Michael Vick into conventional quarterbacks—or, in the case of a guy like Tommie Frazier, not give him a chance at all. The social forces of the NFL, it seems, can be stronger than the economic ones. A good example of wrongheaded NFL groupthink is the league's de facto policy to punt on fourth down. In a recent piece in ESPN the Magazine, Michael Lewis argues that NFL coaches' seemingly irrational fear of going for fourth-down conversions has to do with self-preservation. "Go for it on fourth down more often than any other coach, and you not only set yourself apart from your peers, but you call into question their intelligence," Lewis writes. "If your decision doesn't pay off—if you go for it routinely and your team fails—you'll stand accused of malpractice." By doing the same thing as every other guy with a clipboard, NFL coaches inoculate themselves from criticism. This explains why innovation in pro football is an all-or-nothing affair. The run-and-shoot was laughed out of the league; the West Coast offense went from a radical passing attack to fossilized convention in seconds flat. While the NFL suffers from a collective failure of imagination, it would be folly to transplant a gimmicky college offense to the pro game. A running attack like West Virginia's could never gain chunks of yardage against the pro game's speedy linebackers. A one-dimensional passing game like Texas Tech's would likewise fall to pieces in the face of an NFL pass rush. It's also likely that Urban Meyer's offense wouldn't be as effective in the pros. While the spread-option presents a good run-pass balance, its emphasis on misdirection wouldn't be as confounding to disciplined, smart NFL defensive linemen. The Boise State system—more so than the one-dimensional offenses employed by schools like West Virginia and Texas Tech—would be a good model for an NFL franchise. Don't be misled by the fact that Boise used a lifetime's worth of gadget plays to beat Oklahoma. The Broncos jumped out to a 28-10 lead in the Fiesta Bowl thanks to a fairly straightforward offensive scheme with a few wrinkles—motion, quick snaps—thrown in to get the defense on its heels. Boise State plays less like Texas Tech than like last year's Pittsburgh Steelers, who buttressed a steady passing and running game with a consistent stream of reverses and wide receiver passes. Alas, the Steelers' innovation is one that no NFL team has yet dared to copy. If only some pro football team would dare to give Chris Petersen a job. Come on, Detroit Lions, what have you got to lose? Josh Levin is a Slate associate editor. You can e-mail him at sportsnut@slate.com.